Empty seats have been seen, often in prime positions, during numerous games, including some which were officially sold out. 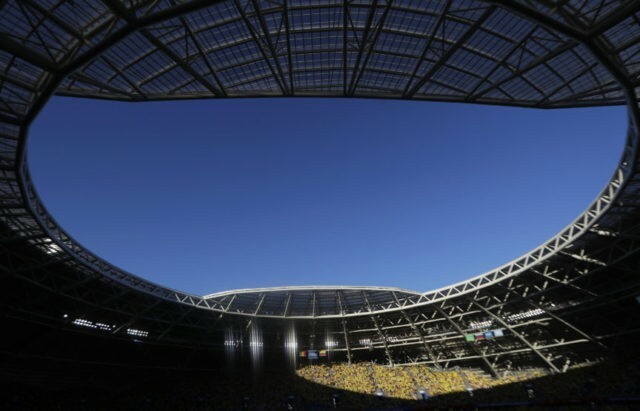 That’s because FIFA measures its 98 percent attendance rate for the World Cup based on the number of tickets sold and delivered, rather than the number of people who attend the game on the day. Croatia midfielder Ivan Rakitic says teammate Luka Modric plays football “from a different planet” and is the best to have ever played for their national team. Rakitic grew up idolizing Croatia midfield great Robert Prosinecki but says Modric, now a four-time Champions League winner with Real Madrid and Croatia’s captain at the World Cup, is at the next level. With many of Croatia’s so-called golden generation into their 30s, including Modric and Rakitic, every game now is potentially their last together at a major tournament. Japan soccer fans debated their team’s controversial tactics at the World Cup, with most accepting them as an inevitable outcome of the tournament’s tiebreaking format. Poland, happy to get a victory after two losses, did little to pressure Japan’s players. “It was a difficult decision by Nishino but the correct one,” said soccer commentator and former player Tetsuo Nakanishi.